Gone are the days of dry erase boards, projectors, screens, monitors and multiple wires and remotes. Today’s conference rooms need only one simple solution for whiteboarding, video conferencing, presenting and screen sharing: CollabEase by MVDconnect. This easy-to-use digital whiteboard is powered by open architecture software that is compatible with all types of operating systems, casting, presenting and mobile devices. So you can hold any type of meeting all from one board — allowing your team members to interact and collaborate seamlessly whether they are across the table or across the globe. 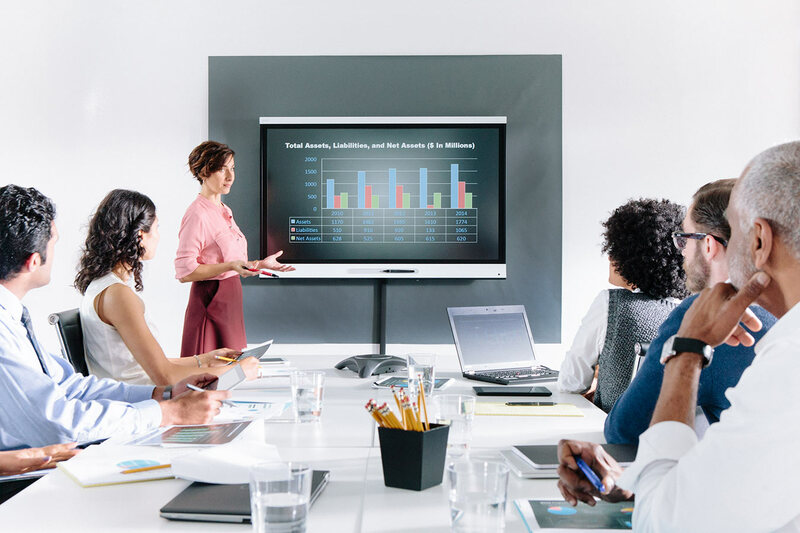 CollabEase smart boards come in various sizes and can be used to capture ideas in an office or personal space and then share them across interactive whiteboards in huddle and team spaces or meeting and boardrooms. Simply write on the screen and/or pull in content — notes, images, slides and more — from other apps. When you’re done, share it all with the team right from the CollabEase smart board. 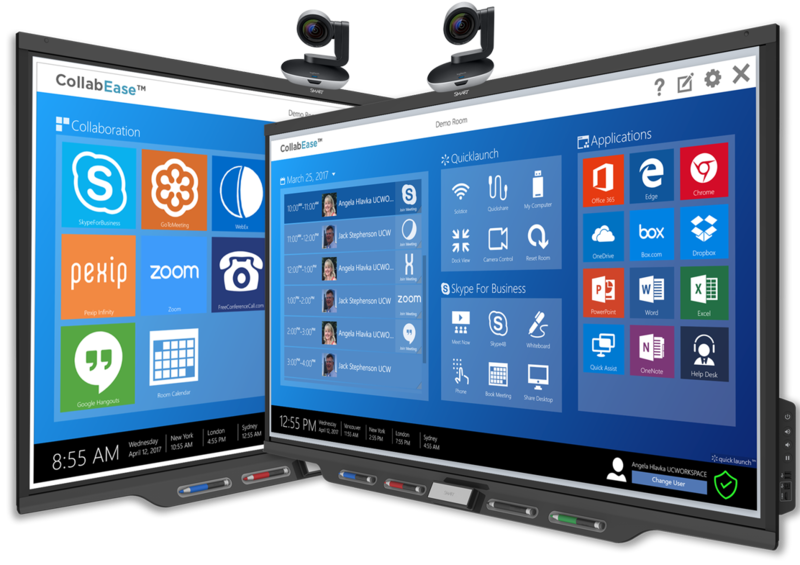 The CollabEase interactive whiteboard utilizes Quicklaunch™, the powerful one-touch meeting room application, so you can begin any type of meeting with a simple tap. Any file or application you can run on your computer or mobile device, you can open, share and interact with on CollabEase. 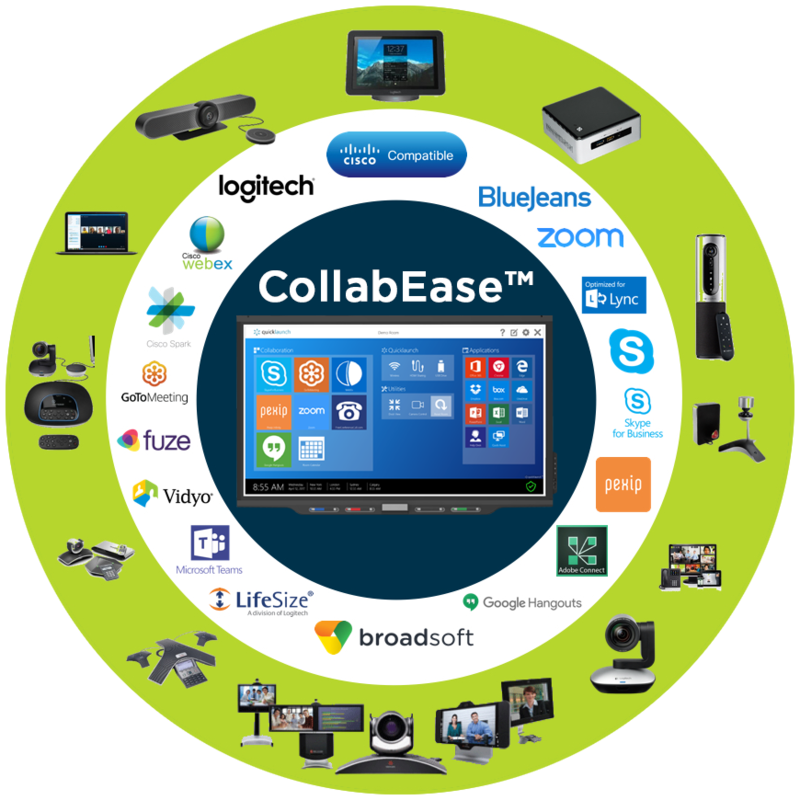 Whether it’s whiteboarding, presenting, video conferencing or screen sharing, the CollabEase open-architecture platform can connect to any device — PC, Mac, iPhone, iPad or Android — to access your files or any application. The powerful visual collaboration software that is bundled with CollabEase digital whiteboards allows users to create and capture ideas in the virtually unlimited interactive Unbound Workspace. Insert images, hyperlinks or other files you need to work on. Write in digital ink, zoom in and out using gestures and pan across the workspace. The MVDconnect Team is committed to customer service. We are dedicated to your success, and we’ll go above and beyond to ensure all your needs are supported — from installing CollabEase to training your staff. MVDconnect will only contact you about our relevant products and services. Please fill in all fields. What else would you like to hear more about? Check all that apply. MVDconnect is a full-solution, managed service provider of custom communications and collaboration platforms aligned with your business challenges and growth initiatives. With high levels of certifications from major manufacturers, such as Avaya, Mitel, Polycom, SMART Technologies, and many more, we are able serve our customers, including some of the nation's most respected organizations. With our corporate office located in Cincinnati, Ohio, we offer unbelievably comprehensive business telecommunication solutions nationwide and provide a full suite of managed services and products – collaboration tools, carrier management, video conferencing, mobility, Wi-Fi and networking, PBX maintenance, VOIP, and so much more.